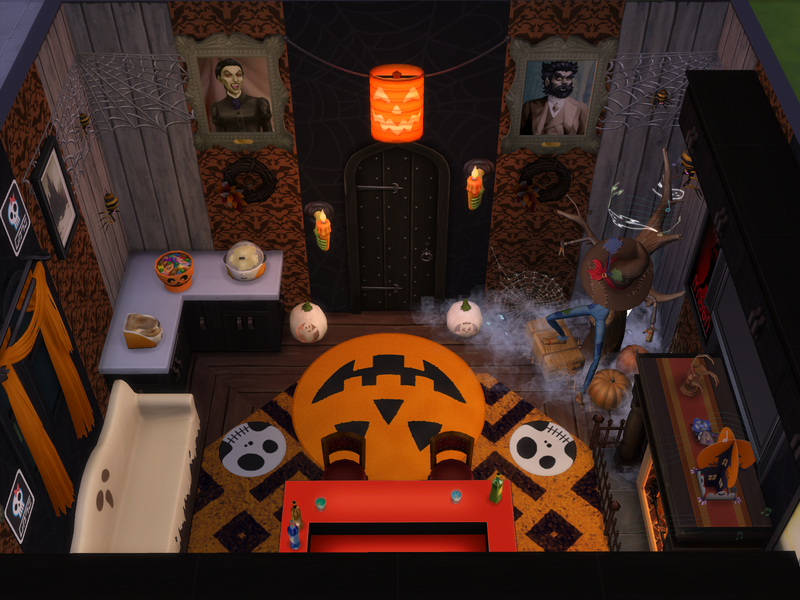 Jack Pumpkin looks such a creatively great room! 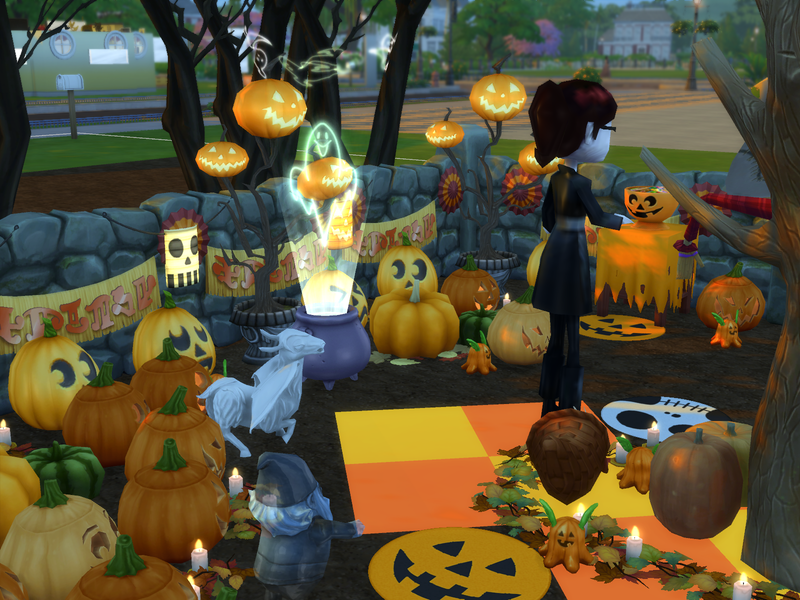 The variety of pumpkins used and the placement of them in the room on the floor areas looks so very great ! It is a great touch that there is a pumpkin carver station in the room, and the pumpkin lights are either sides of it! Very nice design of the middle area of the room! 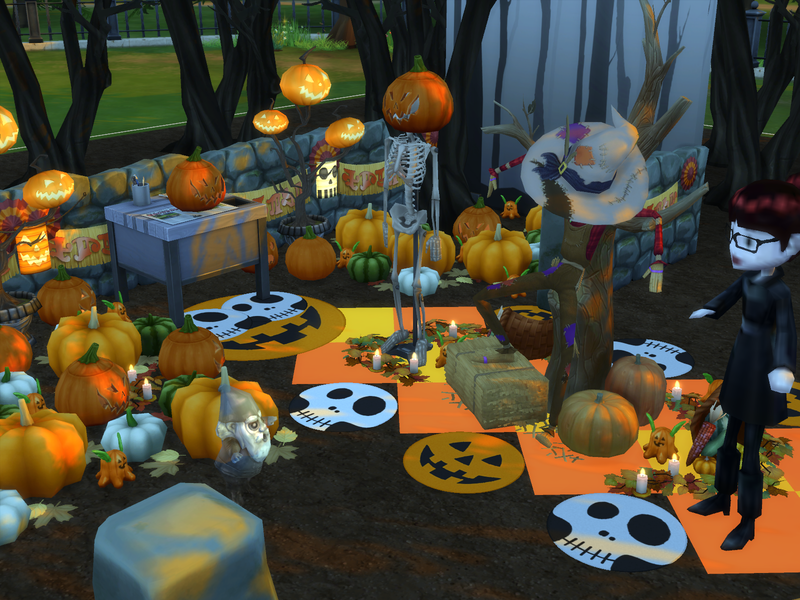 Patchy looks great placed in the middle of the area, and the orange and yellow diamonds and skeleton and pumpkin faces floor rugs look great there! The skeleton with the pumpkin head is very creative! The enlarged doll with the black clothing is great there! The black trees wallpaper on the wall suits the room well! The cauldron with the ghost light effects goes well in the room! 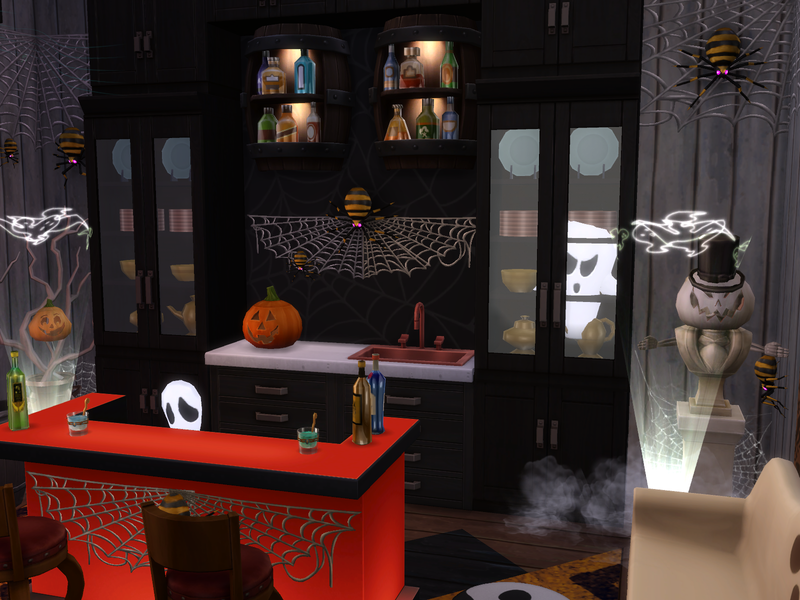 It is a great room for Halloween ! 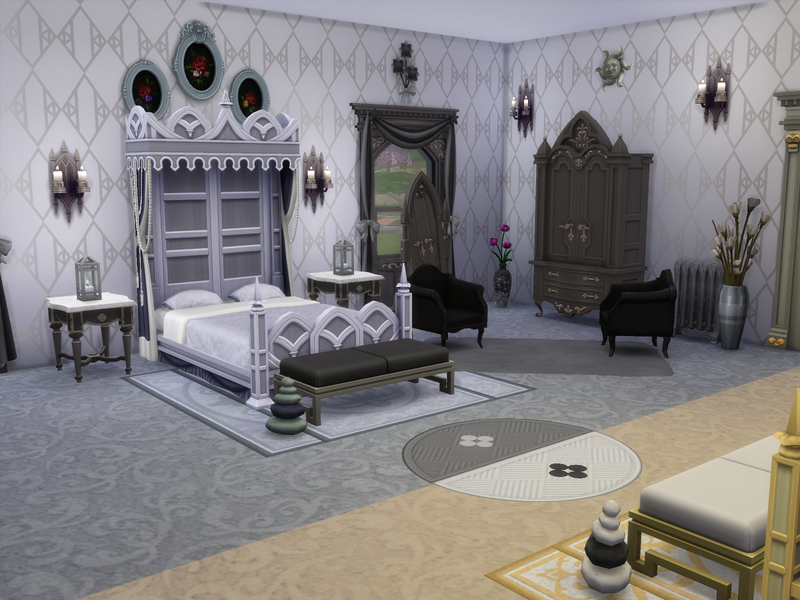 The furnishing and design of Night and Day is very nice! It looks great the way that half of the room uses the black/grey colour scheme and the other half uses the yellow/white colour, and each side mirrors the other. 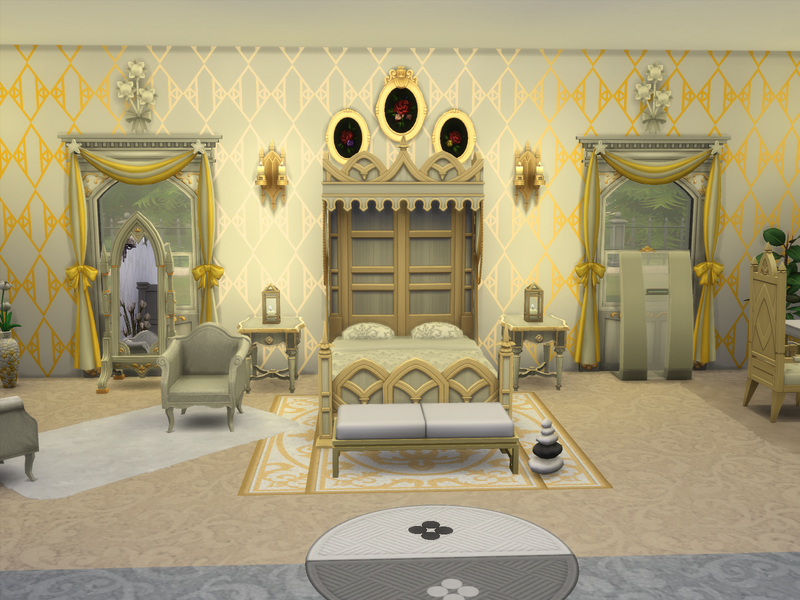 It looks such a very elegant room! 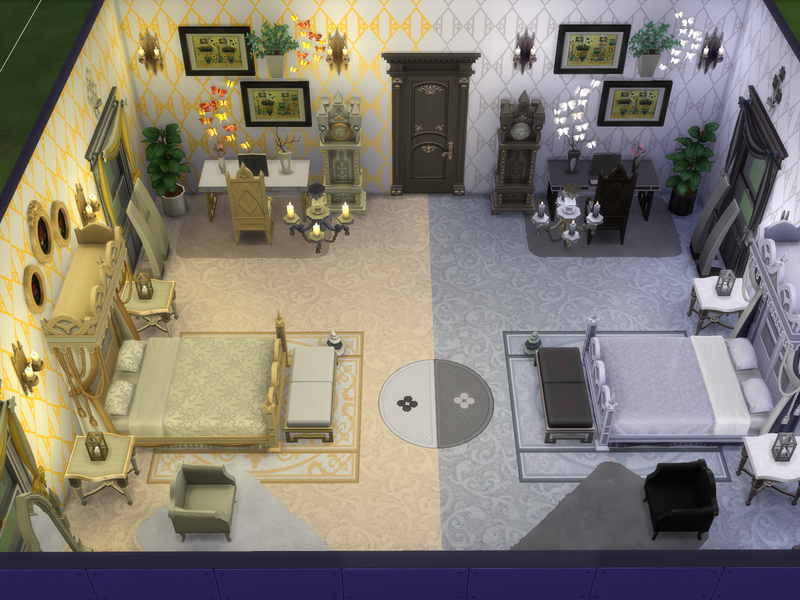 The wallpaper patten and flooring pattern in the two colours looks very nice ! Very nice design of the study desk areas! The way that you have placed the pictures, the pretty butterflies , the wall candlelights, and the plants on the wall areas and in the corners looks so very creative! Thankyou so very much for using my pictures in your room! The type of study chair used looks nice. 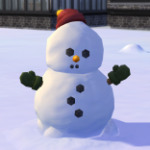 Sims will enjoy sitting there in the two colour versions using the computer. The two colours of grandfather clocks look nice placed on each side of the door. The two colours of curtains look nice on the windows. 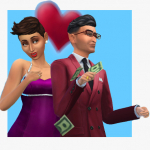 Sims will have lots of fun dancing to the stereo music! The design of the bed looks very nice! The two colours used, and way that they are directly facing each other looks great! The flower pictures are a nice touch on the bedhead walls and the candles are restful touches on the bedside tables. 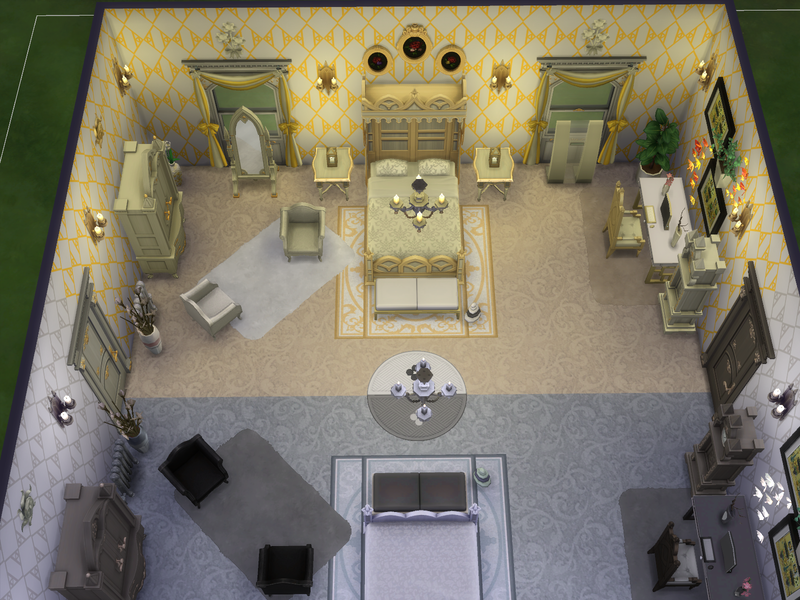 The ottoman stools are a nice touch at the foot of the beds and the zen decor item is calming for Sims to see when sitting there. 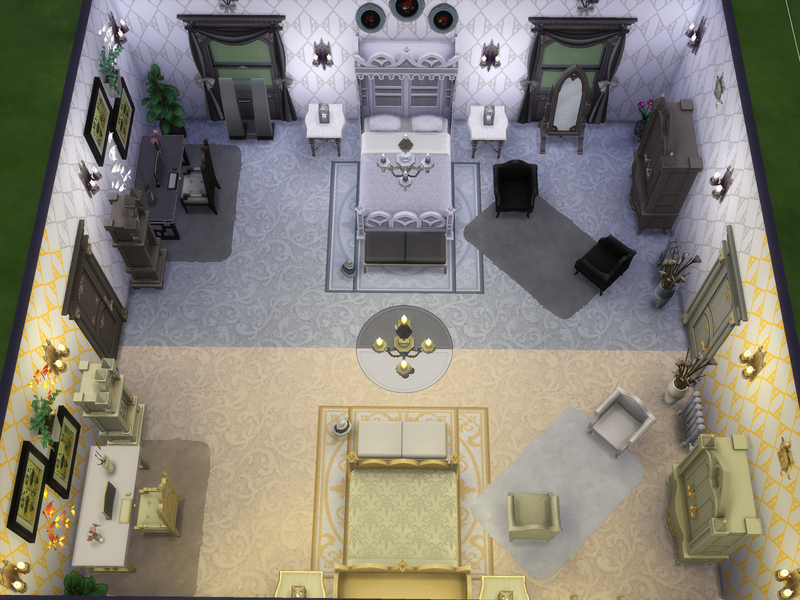 The black and white circular floor rug looks nice in the middle of the room with half either sides. It looks great the way that the armchairs have been angled. Sims will enjoy sitting relaxing there. The two elegant full length oval mirrors in the two colour versions look great placed near the windows. The wall candlelights and sun wall decor look very nice how they have been placed on the dresser closet walls . 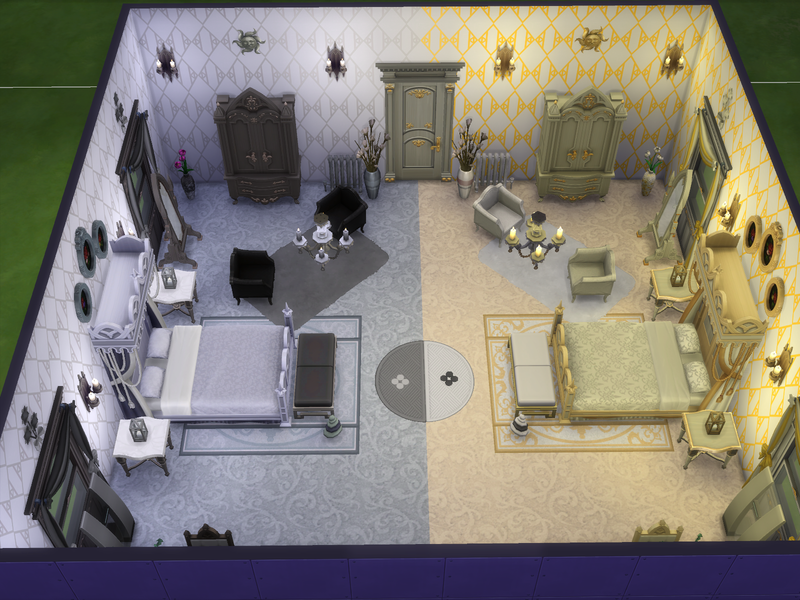 The furnishing of the room looks very elegantly nice, and the two colour schemes of the room and how the furnishings are mirrored look great! You’re welcome Thankyou very much! Congratulations on Night and Day being favourited by Maxis! That is great! Yup, congrats on the showcase! 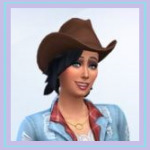 Congratulations on your Maxis fave @chips46 ! Great room! ! 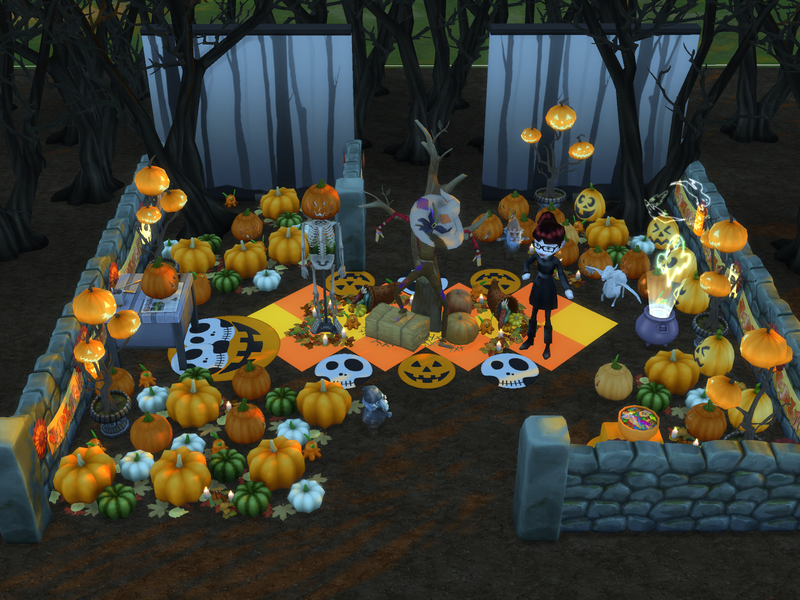 Awesome pumpkin room, as well ! It's so cute ! Hello, dropping by to bookmark this thread.. You have a wonderful gallery! Awesome game room! I like the zombie who's trying to eat the pizza! 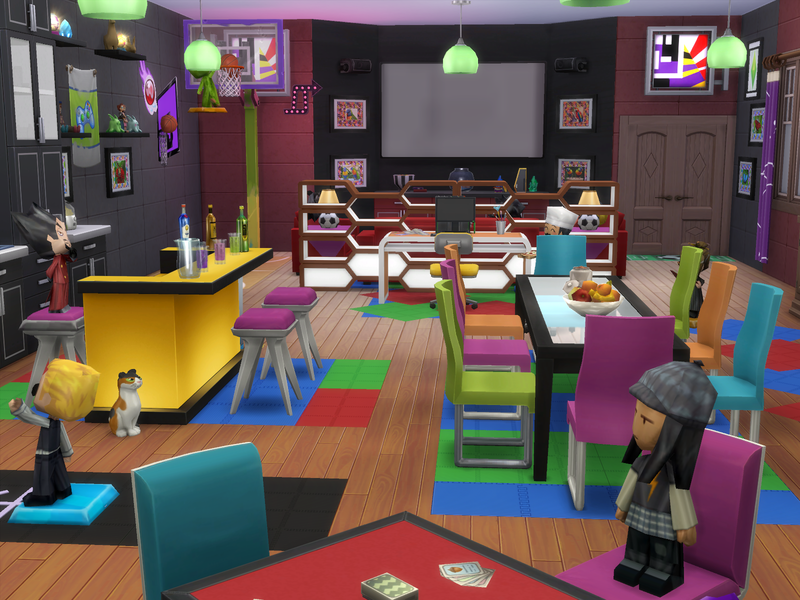 MySims Plays Games is such a very cute, and very creatively designed room! It looks so very colourful and very great! The different coloured chairs around the dining table and card game tables , and the colourful floor tiles in the areas of the room give such a great look to the room! 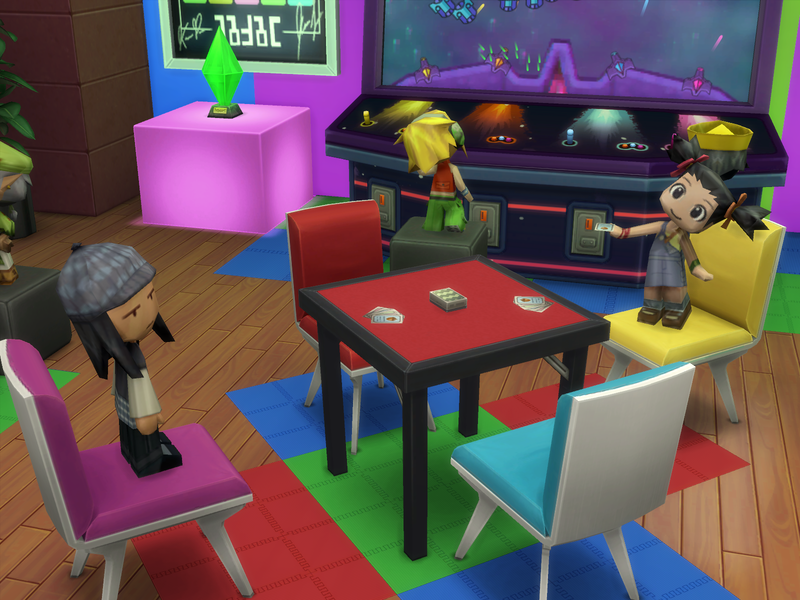 The MySims are look like they are having lots of fun playing card table games and foosball together! Very nice nook area where the MySims are enjoy sitting on the sofas watching the MySims on the tv, and the boy MySims are wanting to play console games! It looks very great how you have set up the statues there! It is great that there is a candy dish there for them to eat some sweets. 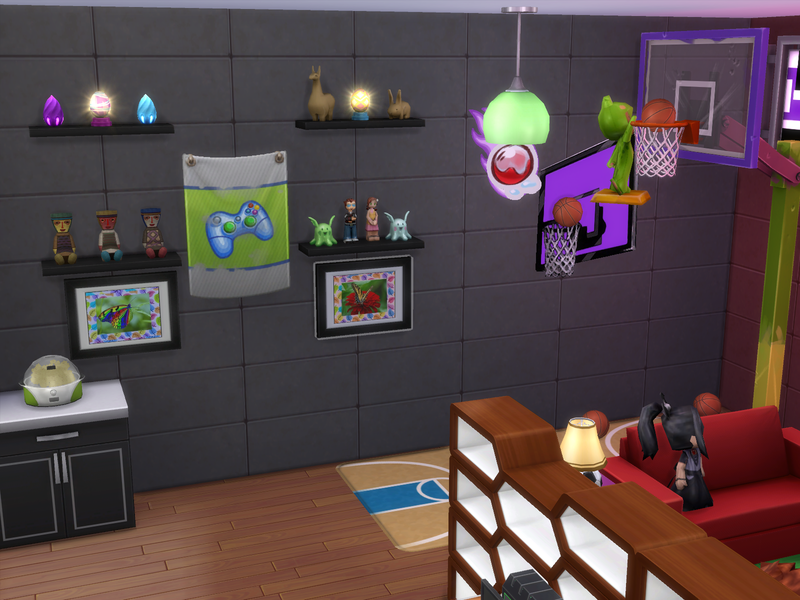 It looks so creatively great way that the MySims is shooting at the basketball hoop! 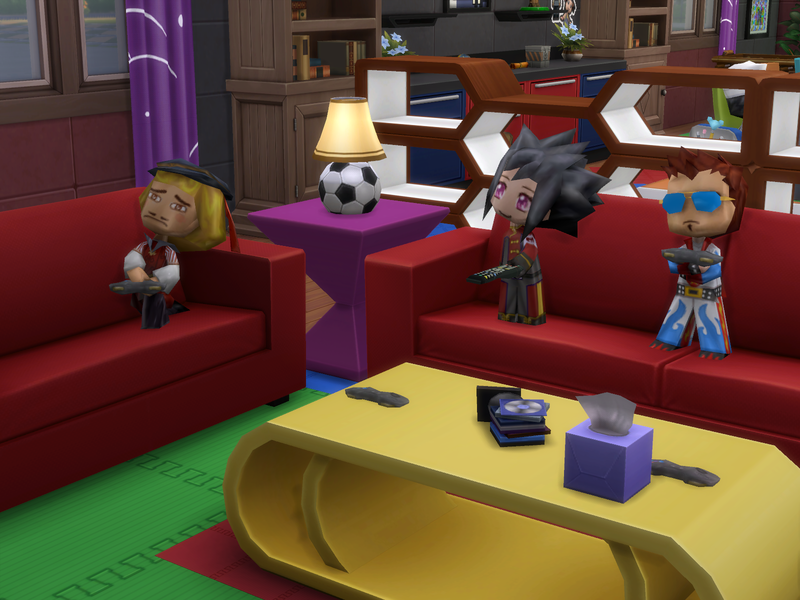 The toys, eggs and crystals are a nice touch on the wall shelves, and the gaming club banner looks great on the wall. The soccer ball lamp there looks great . 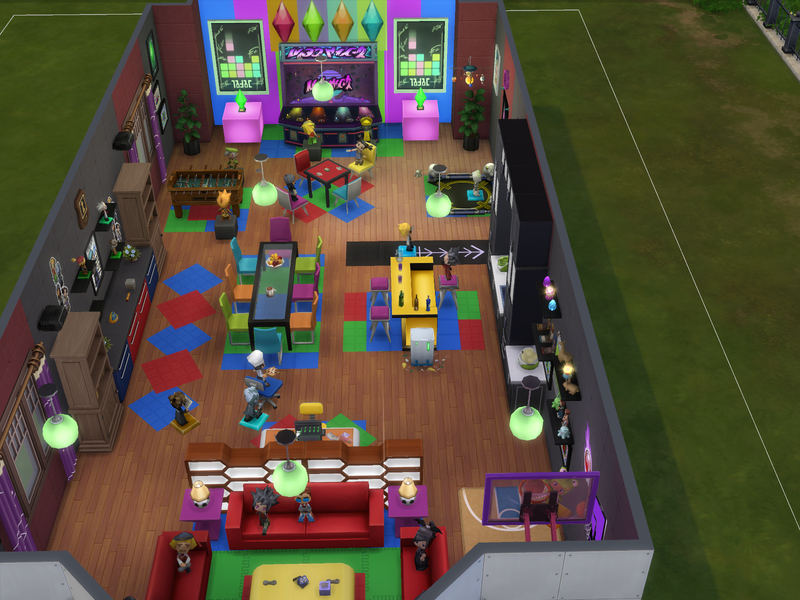 Sims will enjoy making and eating popcorn in the room whilst gaming. Very nice sunny yellow bar counter area! The MySim is a great bar tender there! 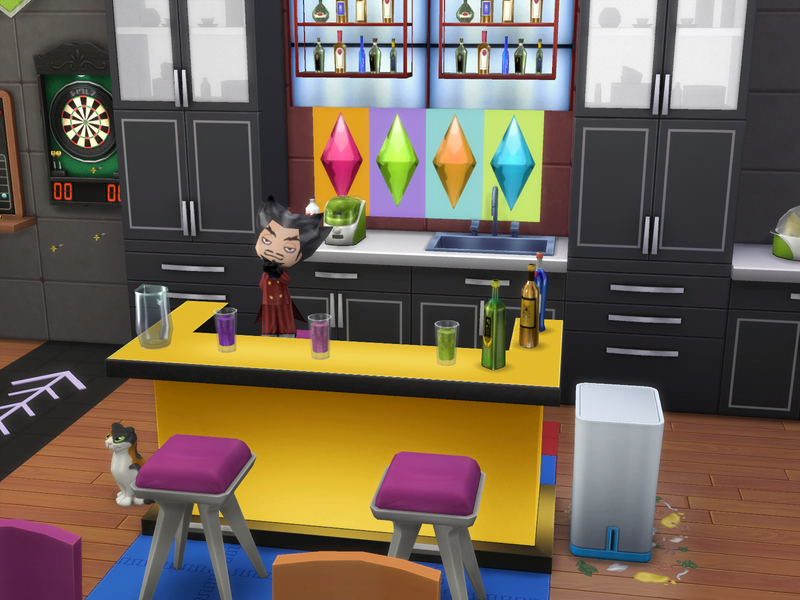 The coloured drinks on the counter look great! The colourful plumbobs picture, and the drinks shelves look great on the wall. The pet cat does look a bit concerned at what is happening! 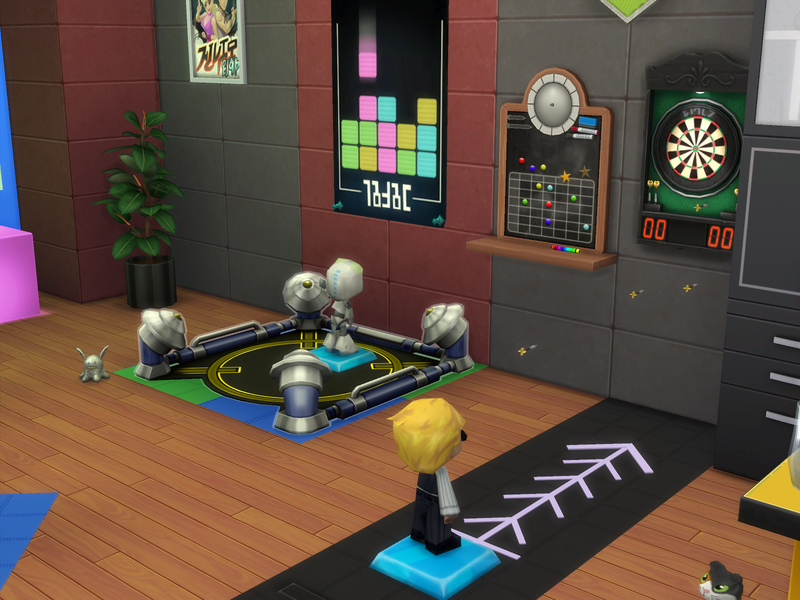 The MySims are having lots of fun playing darts and in the games cube in the room! The blik bloks poster looks great on the wall. 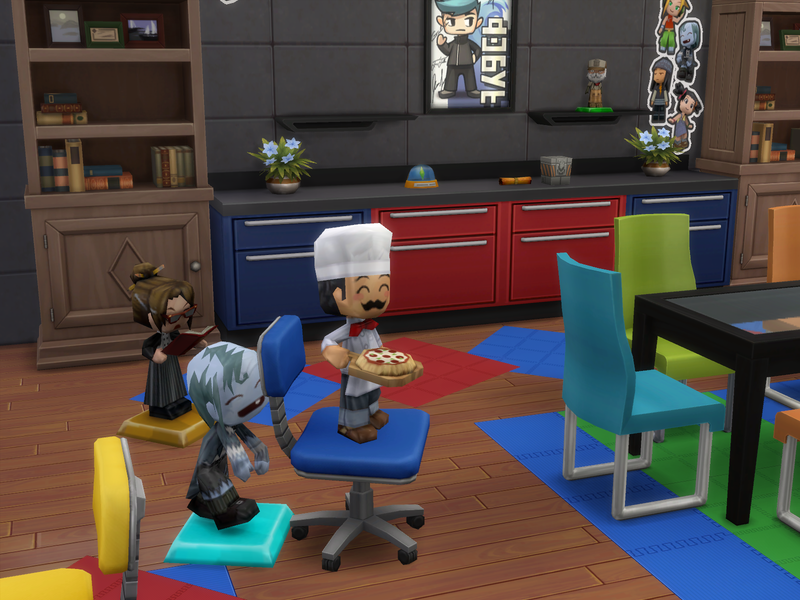 It is great that Chef Gino has made yummy pizza for all the MySims to eat! 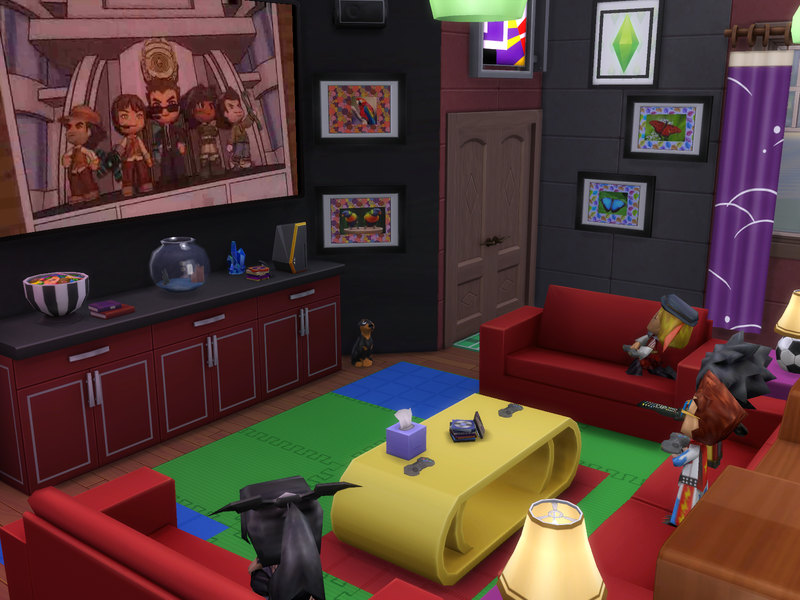 The colourful red and blue counters on the side wall area looks great and the MySims wall print and poster are a nice touch there. 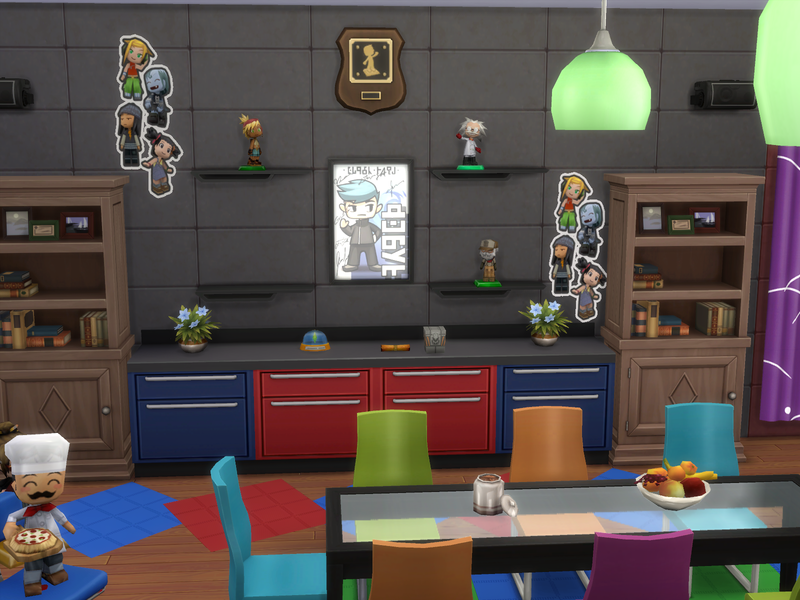 The MySims look great on the wall shelves and the MySims plaque is a very nice touch. The MySims will enjoy reading books from the bookcases. They will like having some delicious fruit from the fruit bowl on the table. 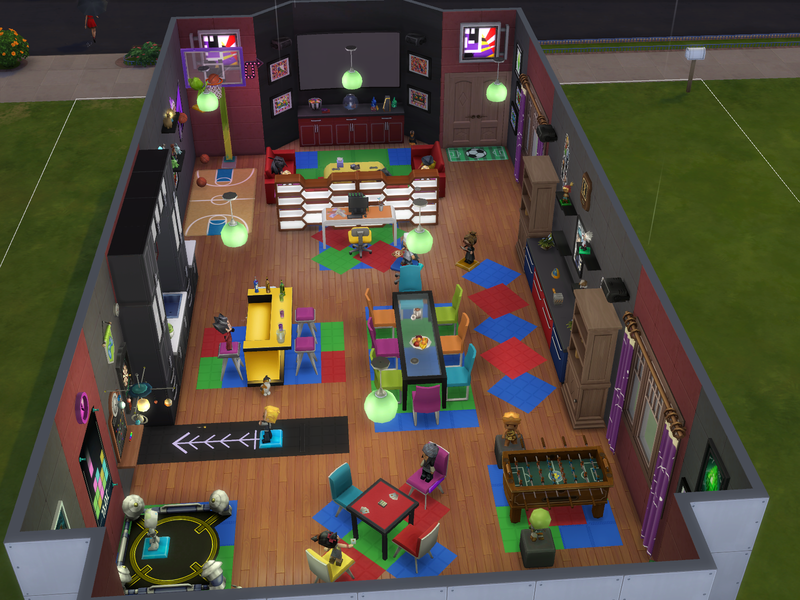 It is great that there is an arcade games machine in the room which the MySim is enjoying playing games on. 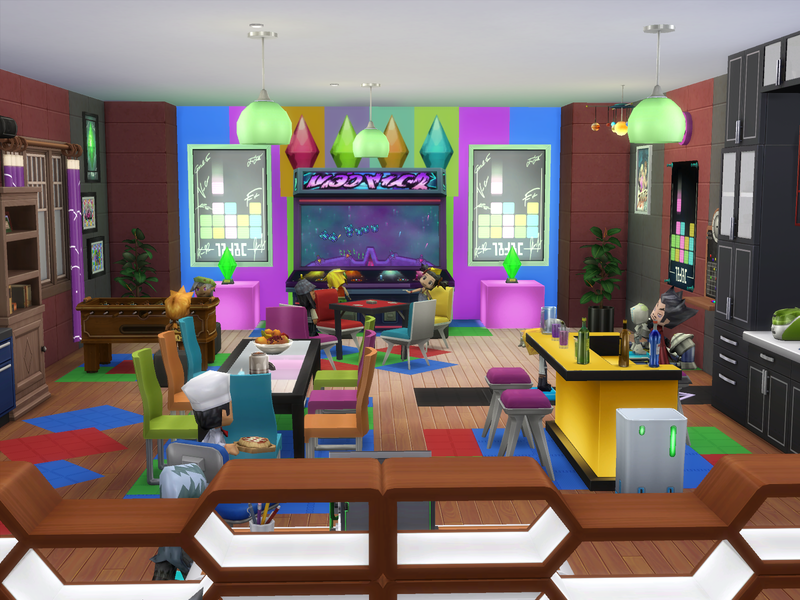 The colourful plumbobs wall picture and the gaming posters look great there on the arcade machine games wall. Thankyou so very, very much for using my pictures in your room ! 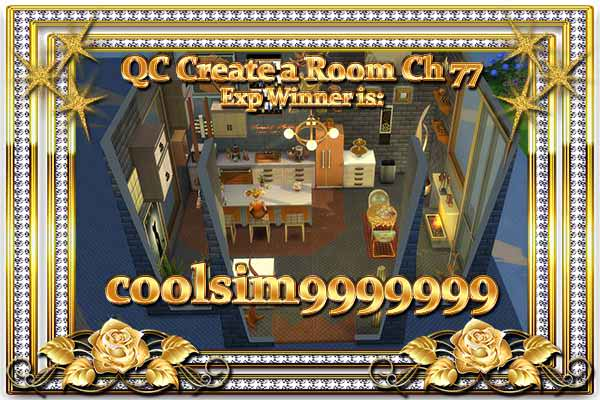 It is such a fun , cute and creative designed room! Thankyou so very much for entering this week’s challenge ! 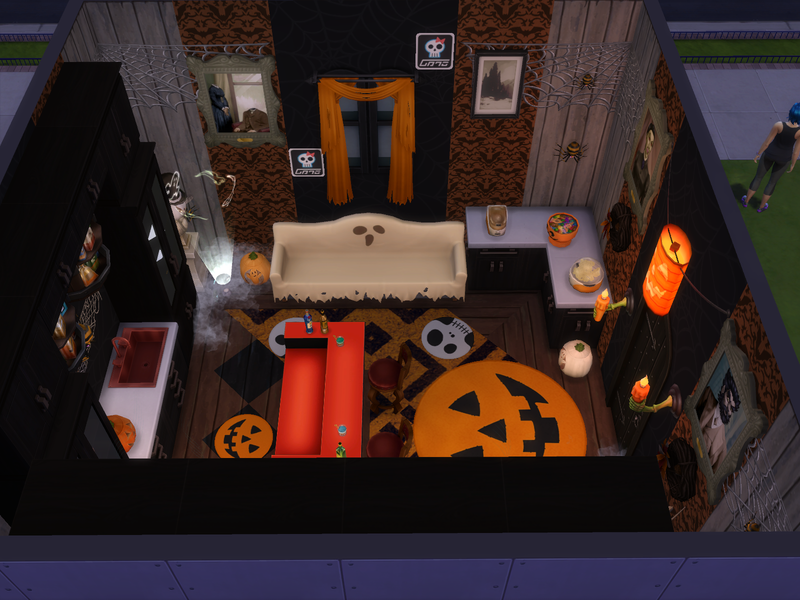 This challenge is in the game gallery that I entered its hosted by #theoctanepumpkin and it's called PumpkinRoomChallenge it's to decorate in Halloween theme only, a 6x6 room in anyway we like as long as it is using Halloween items or paintings that are related to halloween. 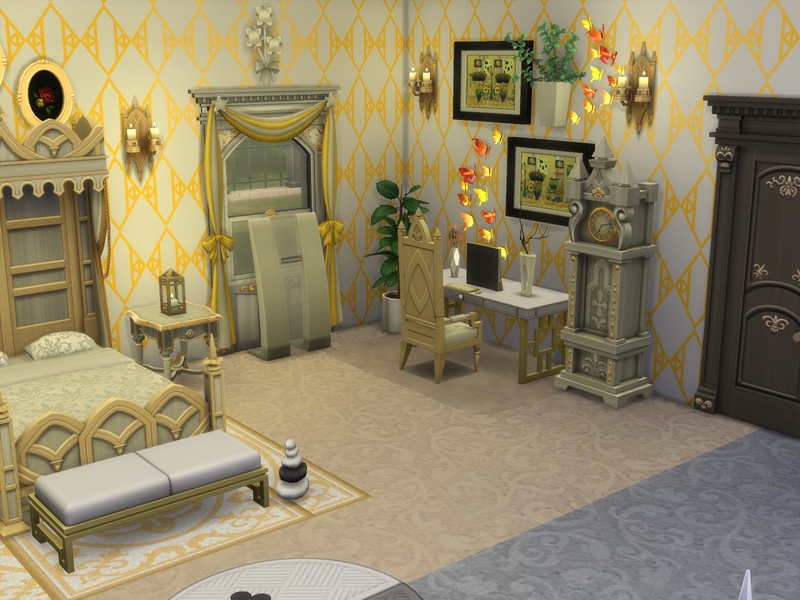 The design and furnishing of the Pumpkin Room Challenge Room looks great ! The weathered textured walls, and the cobwebs and spiders on them, the sink nook wall and on the bar counter gives a great look to the room! 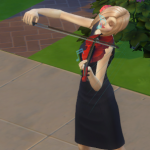 My sim would be scared though in the room with the spiders there! 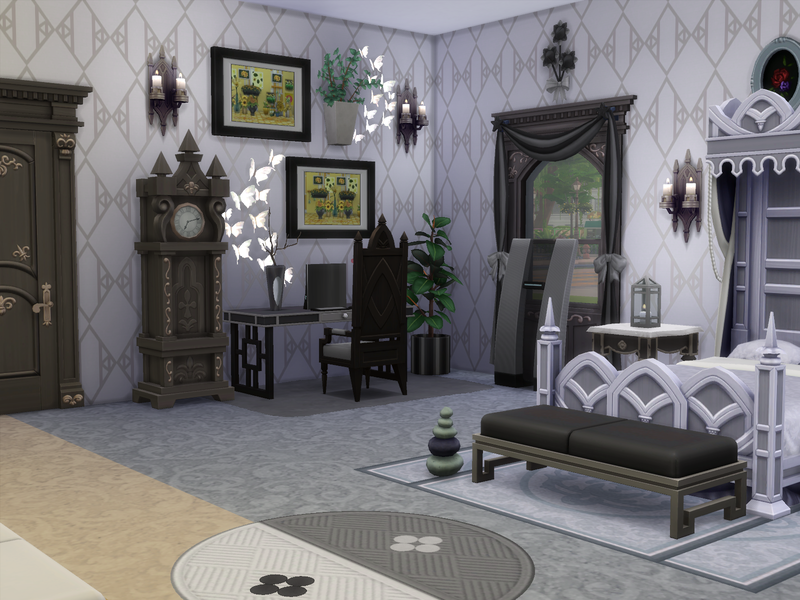 The vampire portraits look great on the walls either sides of the door, and the hand wall candles look great! 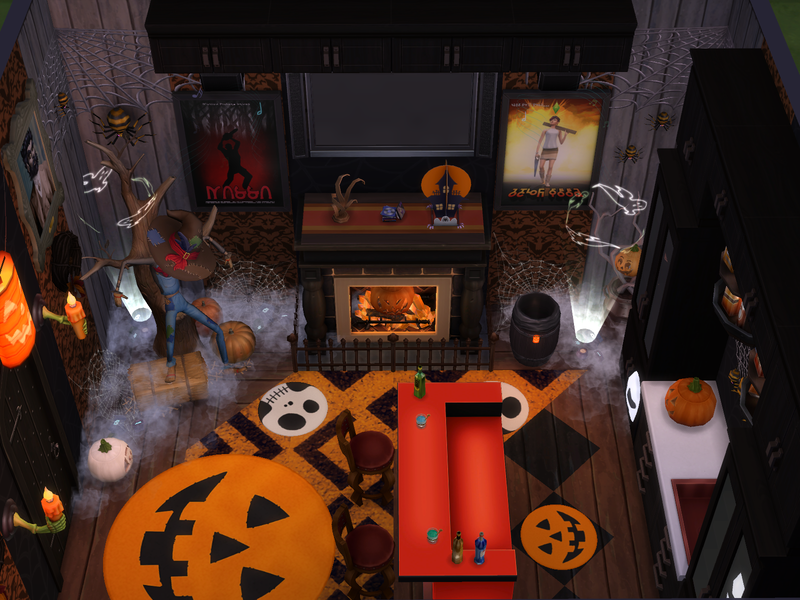 The pumpkin and skeleton floor rugs add a great look to the room, and the Halloween themed diarama is a nice touch on the fireplace ledge. 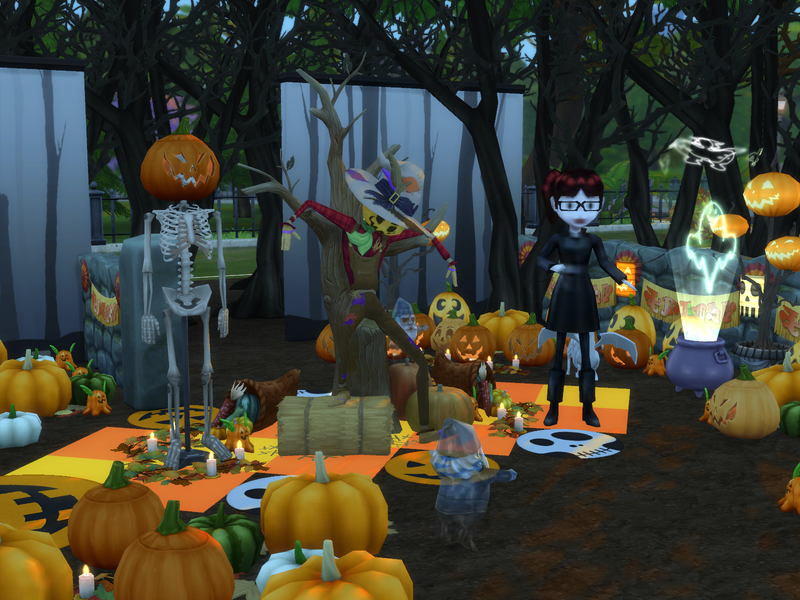 The corner nook with Patchy in the midst of the ghostly foggy effects looks very creatively great! Nice corner snack nook for Sims to enjoy having some candy from the dish , popcorn or ice cream. 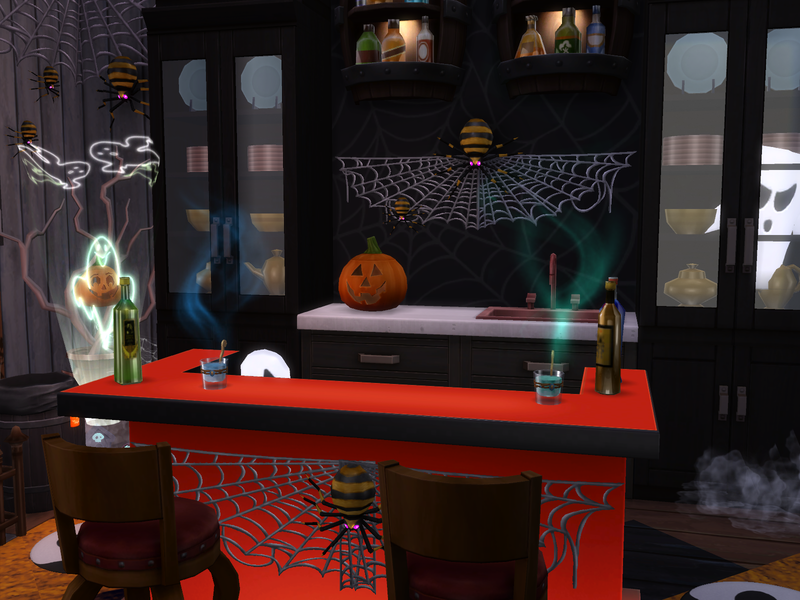 Sims will enjoy sitting on the ghost themed sofa having a drink from the orange/red bar and watching tv. The carved pumpkins look great in the room! It looks great how the kitchen cabinets and drinks cabinets have been placed on the wall to create the sink nook. The torn orange curtains look great in the room. It is great that there is a pumpkin in the fireplace ! 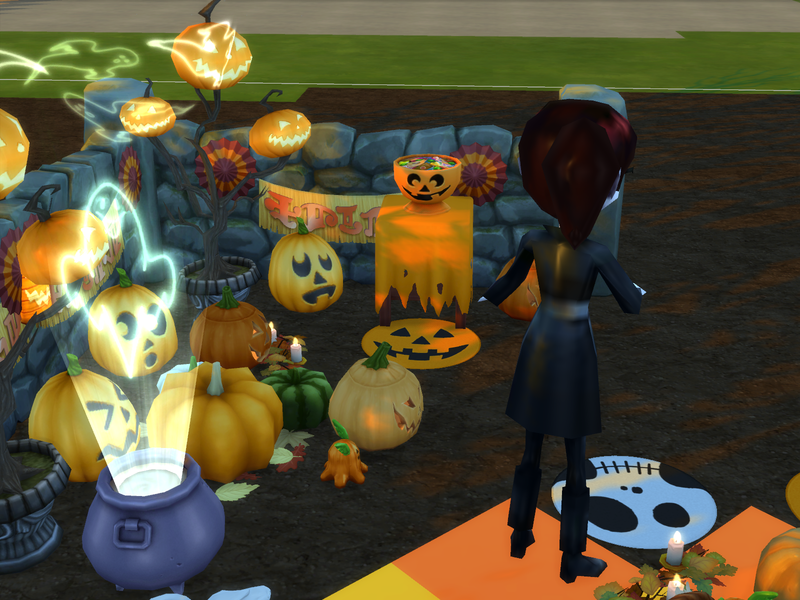 The ghostly light effects with the pumpkin in the midst of it in the other corner nook looks great! The top hat pumpkin is creative ! 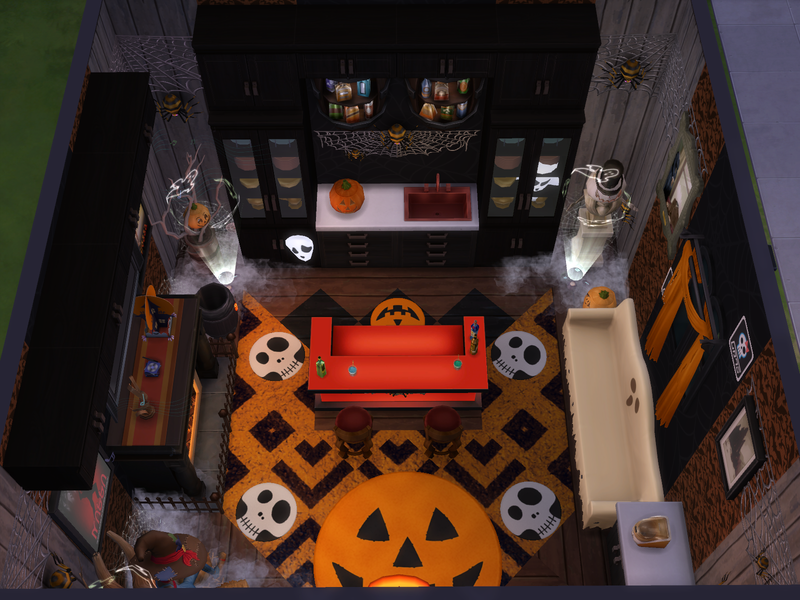 It is a great Halloween pumpkin themed room! 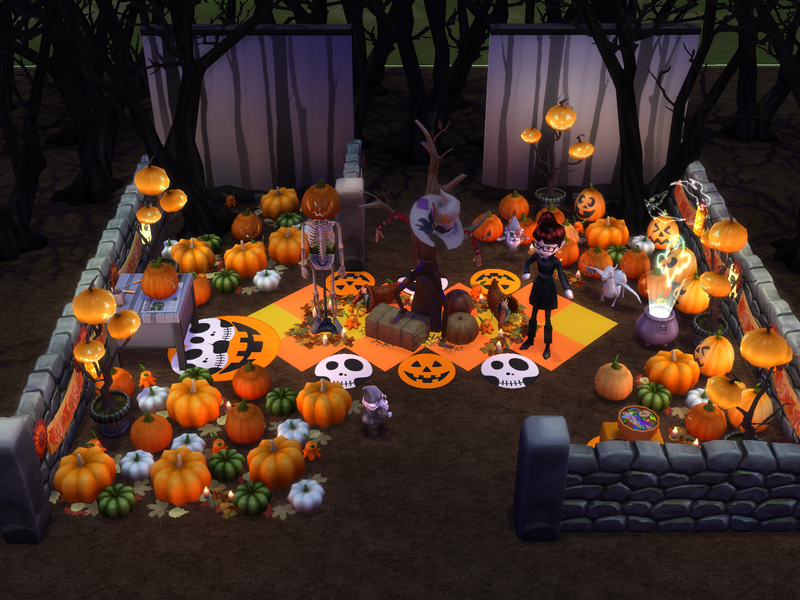 Awesome pumpkin Halloween room, @chips46 ! 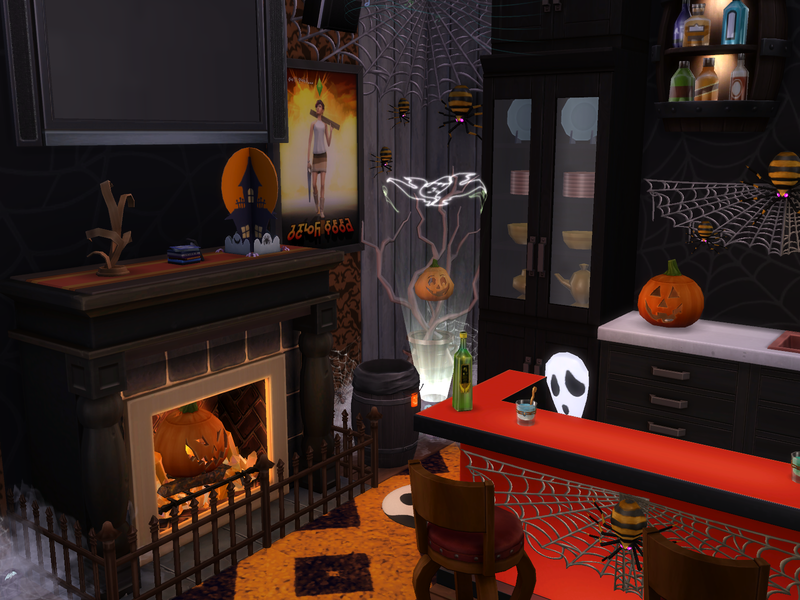 I really like that pumpkin in the fireplace , and all the details are cool !